"Illegal Iraqi refugees in Denmark"
"Illegal Iraqi refugees in Denmark" Two Danish border police stop a car with refugees, one who doesn't even wake up, close to the German border in Padborg, Denmark on March 22, 2007. 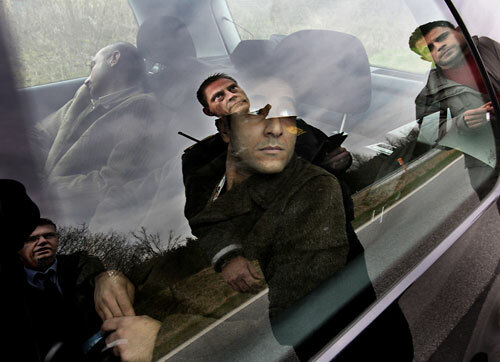 The man with the cigarette on the right hand side of the photo, reflected in the car window, is one of the two refugee smugglers. **Sweden OUT** Many Iraqi refugees travel through Denmark to reach Sweden, one of few European countries that will still grant asylum to Iraqis. Having undertaken grueling journeys across the continent, often paying vast sums of money to smugglers, some end up in Danish refugee centers where they wait indefinitely for asylum in a country which has tightened immigration laws in recent years.